This Unlock! review was made after playing The Formula and The Nautilus’ Traps. Unlock! is a series of cooperative escape room games in which you try to solve puzzles and escape before time runs out. These games were made by Cyril Demaegd and multiple other designers, and they’re published by Space Cowboys. I’m not going to talk about any of the individual Unlock! games here to avoid spoilers, but I will be going over how the system works. All of the games’ BGG and Amazon pages will tell you exactly what you should expect theme-wise. Each Unlock! game will come with a small rule book, a tutorial for players who are new to the the system, and a deck of cards that creates the environment you’re trying to escape. You’ll also need to get the Unlock! app, which has a timer, hints, and ways for you to punch in codes. Every card found in the deck has a number on it. Some of the rooms you enter will tell you to grab certain cards from the deck and lay them out around the room. There are also times when you will need to combine objects that you find and the sum of those cards’ numbers will tell you the next card you should grab from the deck. The numbers on the cards are also important for looking up hints in the app. There are also “Machine and “Code” cards. You’ll use the app to use the machines, and you’ll enter a code in the app when using Code cards. With both of these types of cards you will have to find other cards that help you solve the puzzles. You are on a timer while playing these games, so you can’t just sit there and take your time trying to solve the puzzles. However, you really can’t rush through them either since you’ll be penalized one or more minutes every time you enter something incorrectly in the app or grab “Penalty” cards from the deck. You can only get a perfect score if you are able to solve the final puzzle before the time runs out, but you are supposed to keep playing even after the buzzer. Once you’ve solved the last puzzle, the app will tell you how well you did. The designers did a great job of creating an escape room experience with just a single deck of cards. No, it’s not the same as going to an actual escape room, but it has a similar intensity to it. There are some very clever puzzles in these games. Not once were we able to solve a puzzle right away, and we’re usually pretty good at puzzles. One huge advantage that the Unlock! series has over the other escape room games is that you can easily put the games back in their boxes after you’re done and pass them on to the next group. We had no problems with the app in the games we played. It functions as it should and the music definitely helps to get you into the theme. The tutorial is short and excellent. Everyone I played with fully understood how the game worked after going through the tutorial. I really like the artwork on the cards, especially in the The Nautilus’ Traps. You definitely can run into the alpha player problem in these Unlock! games, but I think the bigger problem is that some people will feel left out if they’re not good at solving puzzles. It’s very natural for the better puzzle-solvers to take over in timed games like these. This is a one-off gaming experience, which will make it an automatic no-go for some people. We weren’t huge fans of the two Unlock! 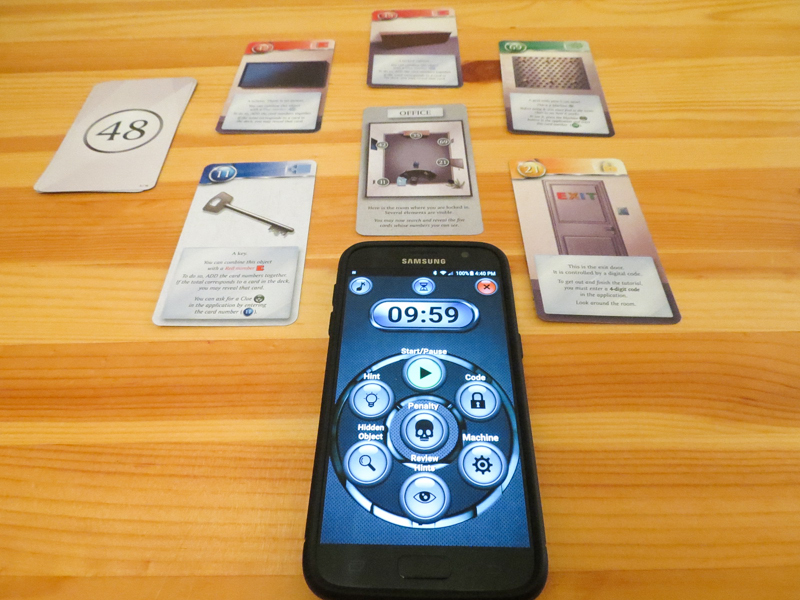 games we played, but everyone in my group loves this escape room system the designers created. There are some very cool puzzles to solve and it really is a great group activity. From what I’ve read and heard there are other games in the series that are fantastic, and I’m really looking forward to playing them. 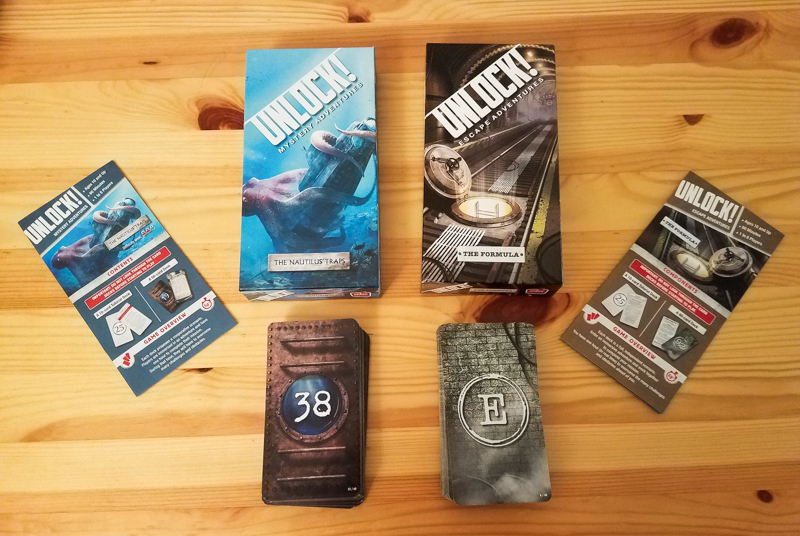 If you like puzzly games or you just want to see what it’s like to play an escape room in a box, definitely give one or more of the Unlock! games a try. Thanks for taking the time to read our Unlock! review! To stay updated on all things cooperative board games, follow us on Twitter, Facebook, or via RSS. Posted in ReviewsTagged card game, Cyril Demaegd, escape room, exploration, puzzle, real-time, Release Year: 2017, Space Cowboys, Unlock!